Riga International Airport closed January 2018 with a 20% increase in the number of passengers while cargos grew by almost 90% compared to January 2017, writes LETA, according to the airport's preliminary data. In January this year, the Riga airport served 443,524 passengers, which is a 20% rise compared to the same month in 2017, and cargo handling grew 87.3% year-on-year to 2,464 tons. The number of flights handled by the airport in January 2018 increased 18% from January 2017 to 6,037. "The increase in the passenger numbers was first of all facilitated by the exciting winter destinations from Riga Airport, which offer our travelers a wide range of options. They can enjoy winter activities or easily get to a sunny resort, or go on a business trip to any of Europe's big air traffic hubs," said Ilona Lice, CEO of Riga International Airport. "The flow of transit and transfer passengers also keeps growing. In January, the number of transit passengers travelling through Riga increased by 24.1%," she said. The offer of the airlines operating at Riga Airport for the summer season of 2018 allows forecasting a further increase in the passenger numbers. According to Lice, airlines have already announced opening of 13 new destinations from Riga Airport this summer, and the total number of destinations will thus reach 96. It will be the widest network of routes in the history of Riga Airport. New destinations in the summer season of 2018 (it will start in March, together with the transition to the summer time) will be launched by the national airline airBaltic, which will operate flights to Lisbon, Malaga, Split, Gdansk, Bordeaux, Sochi, Kaliningrad and Almaty. The Irish low-cost airline Ryanair will start flights to Girona, Paphos and Bourgas, while the Hungarian low-cost airline Wizzair will launch flights to Kutaisi in Georgia. For the first time in history, the Latvian-based carrier Primera Air will launch its service from Riga Airport, offering passengers an opportunity to travel to Malaga. Riga International Airport is the largest air traffic hub in the Baltic states. 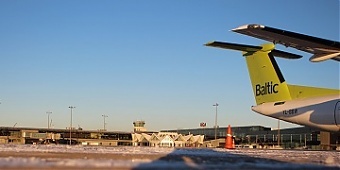 The airport offers flights to more than 60 destinations in the winter season and to nearly 90 destinations in summer, operated by 20 airlines. In 2017, the Riga airport served over six million passengers or 45% of the total number of air passengers in the three Baltic states.